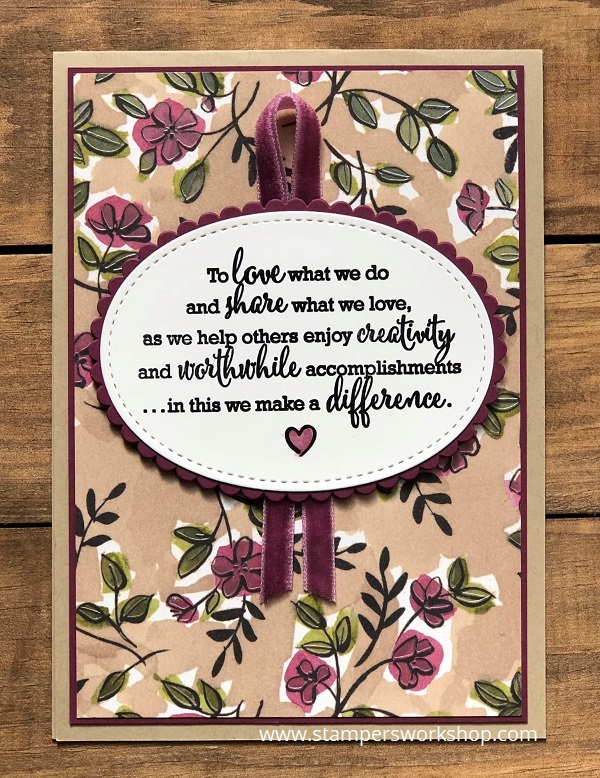 Hi, one of the things I love most about Stampin’ Up! might surprise you. Of course, I love the stamps, inks and papers but I also I love their Statement of the Heart. To love what we do and share what we love, as we help others enjoy creativity and worthwhile accomplishments…in this we make a difference. It is beautiful and meaningful. I love crafting – it makes me happy. I take any opportunity I can to create. I love sharing ideas and inspiration and hopefully I succeed in inspiring as well as encouraging you to use the things you are buying. Today’s card features the Statement of the Heart stamp set which you can get for free if you buy the Gotta Have It All Bundle from the upcoming Share what you Love Suite pre-order (starting May 1, 2018). Unfortunately, it won’t be available in the new catalogue so during May (or you can get it now if you sign up as a Demonstrator) is the only opportunity you have to get this gorgeous stamp. I’ve kept the card super simple as I also wanted to showcase the gorgeous Share What You Love Speciality Designer Series Paper. I love the pearl finish to this paper. Stunning! The simplicity of the design would really lend itself to mass production. If you are a paper hoarder, I encourage you to pull it out, cut it up and make some of these cards. You could always vary the sentiment and the shape on which you stamp the sentiment. Plus you could also add embellishments such as additional flowers. So many ways to vary and step-up the design!